Eligibility: High Secondary Certificate 10+2 / CBSE / Other recognized as equivalent thereto with minimum 70% marks (60% for SC/ST Applicants) in relevant stream. LL.M in Business Law, Constitutional Law & Human Rights, Intellectual Property Law, International Law and Organization, Environmental Law and Legal Order, Criminal Law and Criminal Justice Administration, Human Rights and Duties Education, Labour and Administrative Law, Taxation Law. Eligibility: A pass in BL/LL.B either 5 years or 3 years with 45% under new regulation or 40% under old regulation. Eligibility: A pass in any degree course / Applicants who are pursuing other course after graduation may also apply. Business Law, Environmental Law, Information Technology Law, Intellectual Property Law, Labour Law, Human Rights & Duties Education, Cyber Forensic and Internet Security, Criminal Law, Criminology and Forensic Science, Law Librarianship, Medico – Legal Aspects, Consumer Law & Protection, Maritime Law. 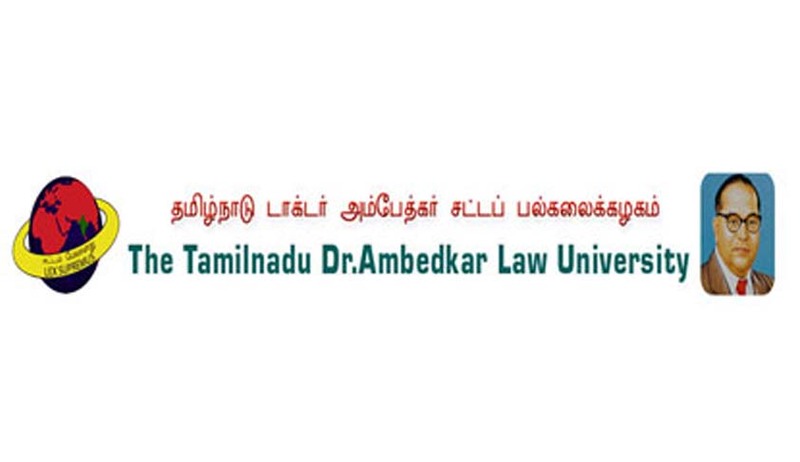 Applications can be obtained in person or by post from The Registrar, Tamil Nadu Dr. Ambedkar Law University, Poompozhil, No.5, Dr. D.G.S. Dinakaran Salai, Chennai-600028 by paying prescribed fee. Applicants seeking application by post are requested to send a requisition letter, mentioning the course to which they are willing to apply, along with requisite fee, to the Registrar. For NRI Applicants seeking admission under NRI quota to all 5 year Honours Degree Courses and 3 year LL.B.(Hons.) Degree Course can obtain the application meant for NRI Quota from The Registrar, The Tamil Nadu Dr. Ambedkar Law University, Chennai in person, on payment of the cost of application of US $200/ for each course, by way of Demand Draft. As to mode of selection and fees please visit the University website. Mode of Payment of Application Fee: The Applicants shall remit the prescribed application processing fee in any branch of Indian Bank through remittance challan which may be downloaded from the University website or obtained from any one of the affiliated Government Law Colleges. Please click here for more information on Fees and other queries.